Ouno Design » Army blanket pillows, swords into ploughshares. Army blanket pillows, swords into ploughshares. This post is a personal addendum to our earlier post about a discussion amongst readers of another design blog about whether one designer had copied or “borrowed” another designer’s idea. We certainly didn’t mean to imply that the second designer copied the first, because those things are impossible to know, and he may well not have, and in any case his design diverged significantly from hers. Anyway, here’s a trivial case from our own experience, and it’s just one among many. It’s about army blanket pillows, which we had thought were our exclusive idea but which of course were not. We hadn’t seen the others until ours began to get some press, and then we realized other people were making them too. Who came first? Do others think we’re copycats, or are they copycats, or is affordable army surplus just in the air, like the warfare version of Depression-Era Chic? It’s nearly impossible to know, and anyway the very idea of pure originality is suspect. Design is a fertile field of rampant cross-pollination, and we hope it remains a fertile field rather than a minefield of intellectual property rights. In any case, as they say, there’s nothing new under the sun. Click below to follow our design process. The photograph at very top is from here – we think the pillows pictured are probably by Red Barn. Directly above, one of our favourite photos, bench pillows from Italian Elle Decor, Summer 2004. Below, pillows by us. PS You can make your own army blanket pillows. We’ll post a DIY soon. In the meantime, check out your local army surplus for blankets or look here. Our story about why we decided to make these pillows, below. Making pillows from vintage army blankets was a natural extension of our process of buying used textile materials by the pound and sifting through them for potential pillow fabrics. We’ve always used a huge variety of curtains, clothing, weavings and assorted vintage textiles, and when we came across some really attractive striped blankets, we decided to use them too. Army surplus after all is a sort of über-recycling. 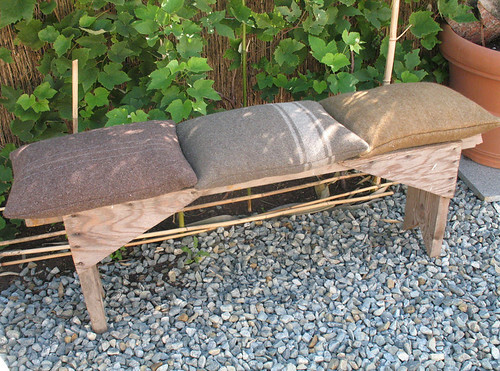 And we’d been looking for heavy, rustic fabric anyway – in the Italian countryside there is a tradition of rough pillows used on benches for big outdoor summer banquets (see bench photo above, from Italian Elle Decor), and we’d always wanted to produce an homage to those. The army blanket pillow idea also fit our taste for a certain kind of rustic minimalism and a certain level of masculinity in design, to offset all the birdies on branches and piping we’ve lately been seeing so much of. So the army blanket thing was appealing, both for its look and for the pleasing idea of turning swords in to ploughshares, especially in light of the global spread of endemic warfare. We had demilitarized army textiles before, using white army surplus camouflage netting as room dividers and lampshades, and people had always liked them. Anyway, we offer this description of the creative process because we’re always interested in how other designers come up with their ideas. This entry was posted on Saturday, January 10th, 2009 at 3:52 pm	and is filed under design, Ouno Design News. You can follow any responses to this entry through the RSS 2.0 feed. You can leave a response, or trackback from your own site. That’s a hot pad. I’d like to live there! 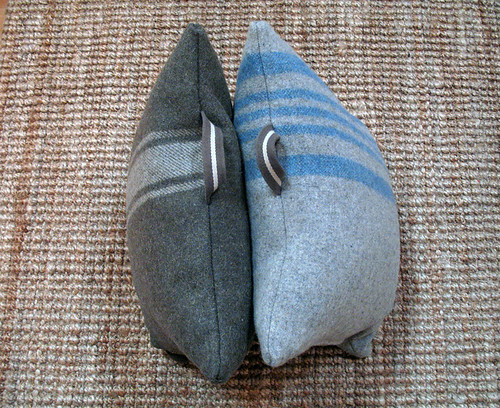 the military pillows are from “flanelle” a little italian company from prato (do you the textile italian city of vintage?). Flanelle is a textile company for home only on demand.